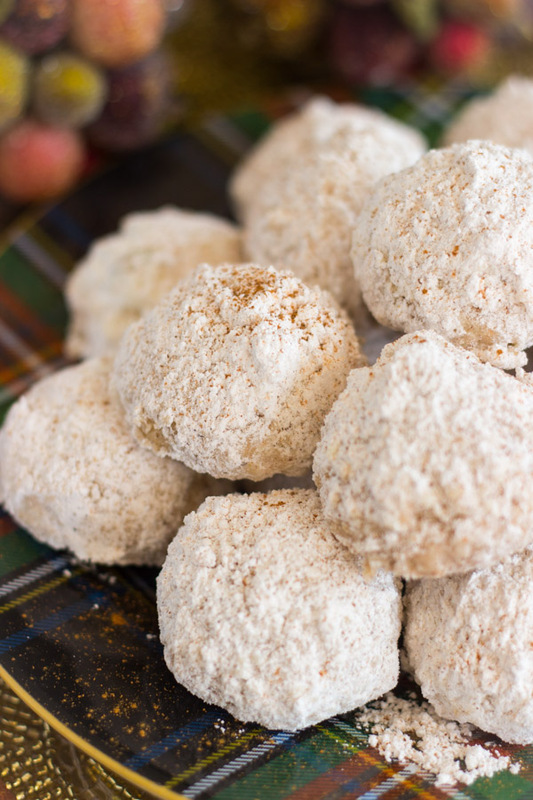 Chai-Spiced Snowballs are as easy to make as the classic version, but they are loaded with warm holiday spices from inside to out! You will adore this incredibly delicious spin on the classic. Heeeeey, another Monday is here. *Frowns* Who is bummed that it’s Monday? I know I’m not the only one. I hope to sweeten your day though with some fun news. Two pieces of news, actually. First, it’s the final day of 12 Days of Christmas giveaways, and if you haven’t already entered, make sure you do! It’s CASH! We can all use extra cash, especially during the holidays. Second, it’s SNOWBALL WEEK. 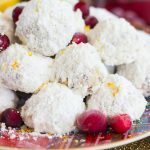 I am sharing different Snowball recipes every day this week. I told a friend over the weekend that I was doing this, and she said “How many kinds of Snowballs can there be?” Unlimited! That’s your answer. I’m sharing 5 different versions, and this is just the tip of the iceberg, my friend. Maybe I’ll do another series next year. Let me know how you like it, and we’ll go from there. Sound good? I chose to do this series with Snowballs because 1. they are versatile, 2. we adore them in my family, and 3. I noticed that lots of readers adore them too! Everybody wins. I told another friend about Snowball week, and she was thrilled. 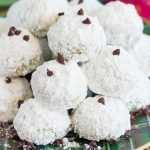 Of course, she benefited greatly from it because I had about 15 dozen Snowballs after working on this series (I made them all in a day, along with three additional cookie recipes!!! ), and I gave her a bunch. I’m still rolling in Snowballs over here though, and it’s been a fine holiday season already, if you ask me. 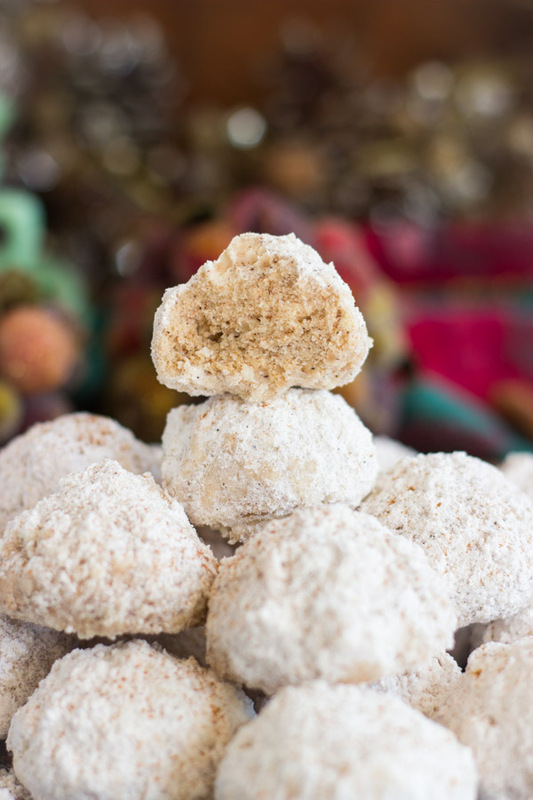 Aside from Cracked Top Ginger Cookies, Snowballs are a cookie that we make every single year at Christmas. And we always double the recipe, at a minimum. Over the years, we’ve learned that it’s really my Mom, Gma, and I that love them the most, and the three of us end up eating most of them. We are totally okay with this. 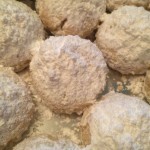 Incidentally, I shared our classic Snowballs recipe three years ago!! Wait til you see those pictures. Truly mortifying. I usually insist that people don’t go and look, but you should go and look. It’ll give you a good chuckle on this Monday. 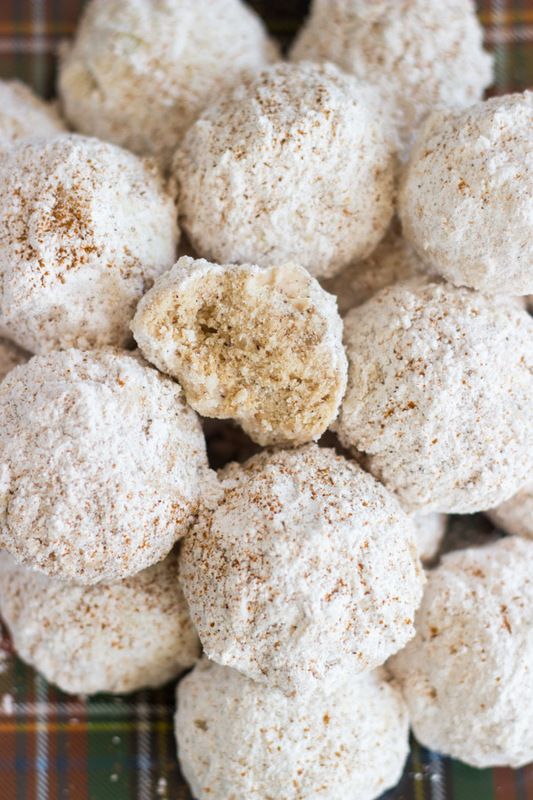 I think the best thing about Snowball cookies is their simplicity. It’s all about the melt-in-your-mouth texture, and the sweetness. 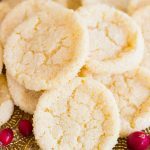 Super basic ingredients, nothing extraordinary in the basic recipe – just shortening, powdered sugar, and flour – but they come together to make an extraordinary cookie! I’m sharing my personal favorite of the 5 for the first day of Snowball week. 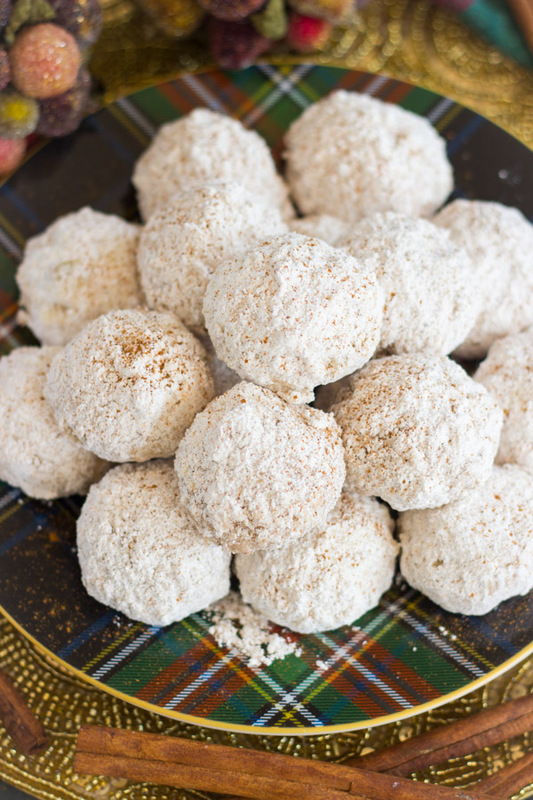 These Chai-Spiced Snowballs. They sound simple, but damn are those spices incredible together. The cardamom and cloves particularly shine, and I can never get enough of those warm spices. And if you’re a person that loves chai tea or chai lattes, and that’s definitely me, then these cookies are definitely for you too. 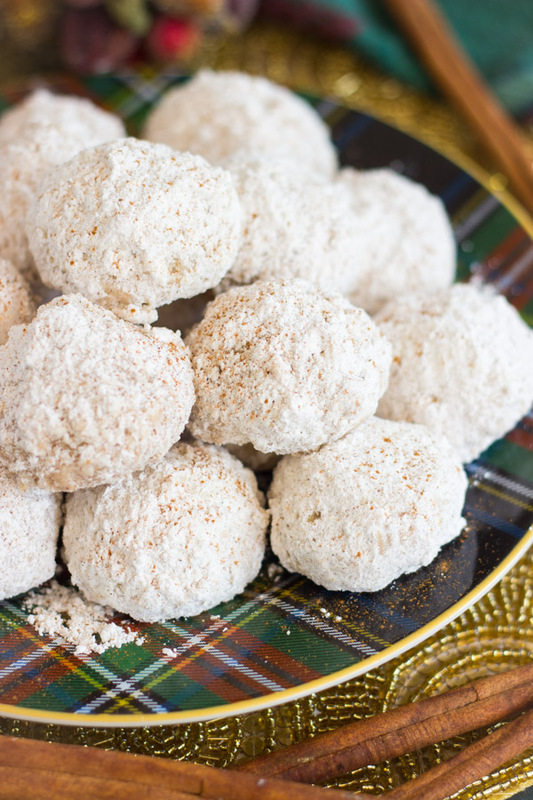 I froze a bunch of Snowballs and I keep eating these Chai-Spiced ones straight from the freezer. They are just too good to stay away from. 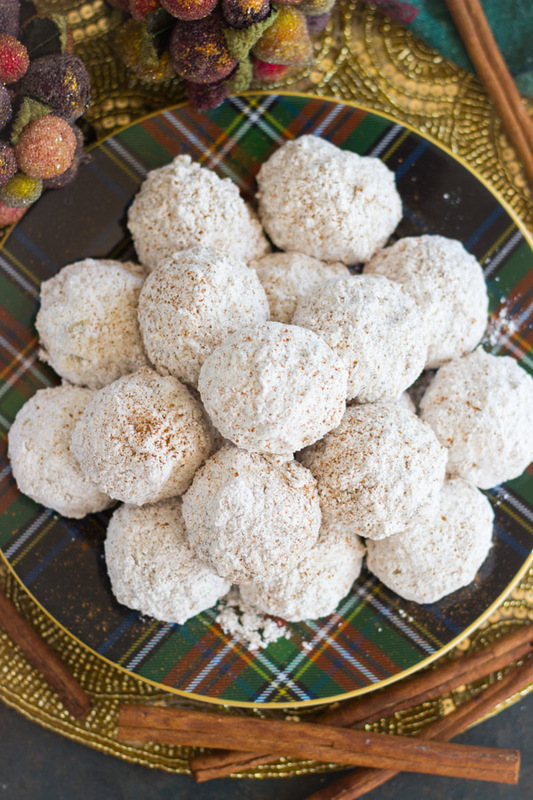 All it takes is a few spices to transform classic Snowballs into these Chai-Spiced Snowballs, and you will be delighted at this delicious version. I hope you’ll come back for the rest of Snowball week! 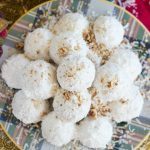 Chai-Spiced Snowballs are as easy to make as the classic version, but they are loaded with warm holiday spices from inside to out! In a large mixing bowl, beat shortening, 1/2 c. powdered sugar, flour, 1 tsp. cardamom, 1/2 tsp. allspice, 1 tsp. cinnamon, 1/2 tsp. clove, 1 tsp. ginger, and vanilla, until well-combined. In a medium bowl, whisk together remaining powdered sugar and remaining spices. These sound amazing. Chai spices are my favorite. Pinning for later! These look really yummy! 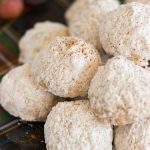 I have never made “snowball” cookies, but I sure do love eating them 🙂 This chai variety looks especially delicious. Merry Christmas! These look tasty! Thanks for sharing at Over the Moon. We look forward to seeing what you share with us in the new year. Have a Merry Christmas! MMM yummy. I bet this are so great! Thanks for linking up with us at Family Joy Blog Link Up Party. Merry Christmas! Fun idea to have a “snowball week”. Didn’t know it was such a yummy versatile cookie! Thanks for linking up with Funtastic Friday! 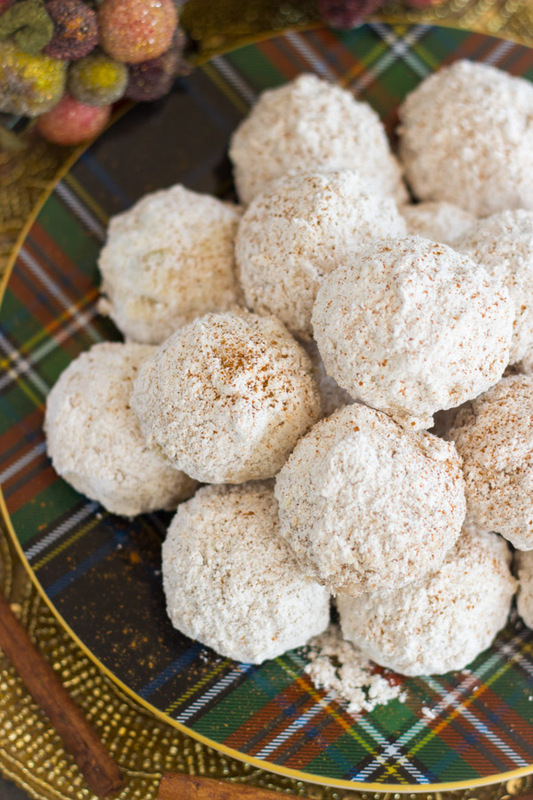 We will just love your Chai Spiced Snowballs, they look amazing! Thanks so much for sharing your awesome recipe with us at Full Plate Thursday! Hope you are having a wonderful week and hope to see you soon! I always found snowballs to be a little boring and bland, I bet if it was chair spiced I wouldn’t feel that way! !